When you have crazy adventurous kids, you have to be prepared for the veritable avalanche of strange, colorful things that will invade your home. Fluffy toys, loud things that spontaneously make noise in the middle of the night, and all kinds of little furniture in garishly bright primary colors. The situation isn’t entirely hopeless, though: some designers are putting the fun back into kids’ furnitures. These pieces are a delight not only for kids, but for their hip parents, too. Check out our complete collection of 90 Creative Urban Furniture Designs. 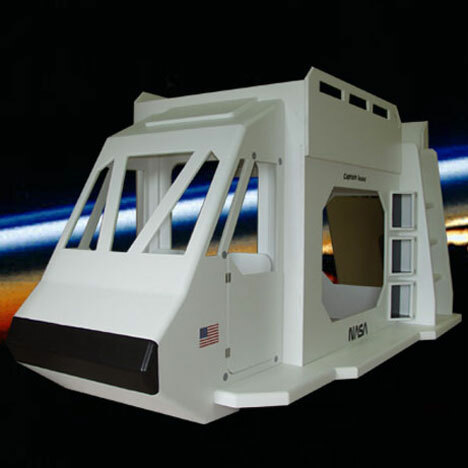 It would be really difficult to think of any cooler way to sleep than in this awesome space shuttle bunk bed. It’s the perfect way to make up for forgetting to pick up your kids at soccer practice or “accidentally” blabbing to their friends about that thumb-sucking thing. 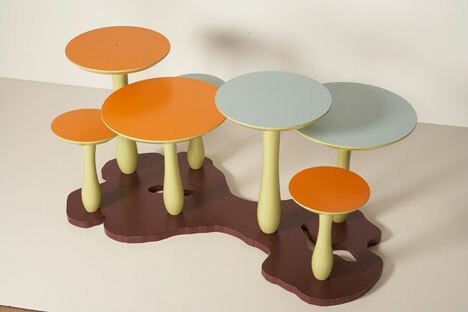 These adorable mushroom tables were intended to go in the living room, but we can see them in a kid’s room holding many treasures. A collection of stuffed animals would be right at home on top of these toadstools. Every kid needs somewhere to stash their collection of overpriced logo shirts that their school pressured you into buying. The accordion dresser, on the left, brings a little bit of whimsy and fun to the dreary task of putting laundry away. 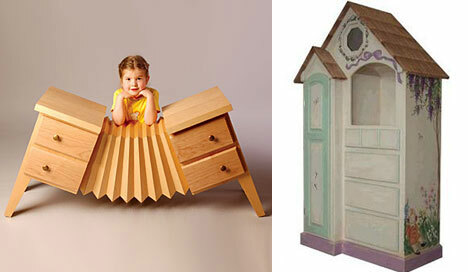 The Emily dresser, on the right, looks kind of like a playhouse but is actually for storing clothes. It’s very feminine and flowery for little princesses. Speaking of little princesses, this ridiculously cool Cinderella pumpkin coach bed would be the perfect way to send your little one off to sleep. Hopefully then she’ll wake up and spin some straw into gold for you, because this bed will run you $47,000. If you’re not ready to splash out that kind of cash, you can still put a little fairy tale into your kids’ rooms. 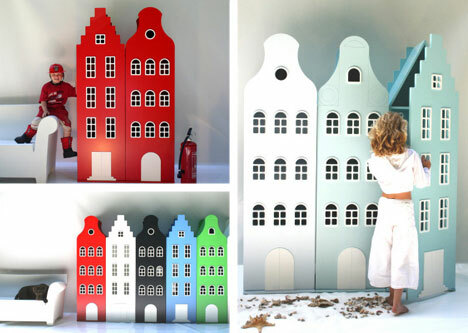 These skyscraper dressers make your little one feel like a giant while keeping their colossal clothing neat and tidy. Remember piling up a bunch of stuffed animals when you were a kid, then curling up on top of them? 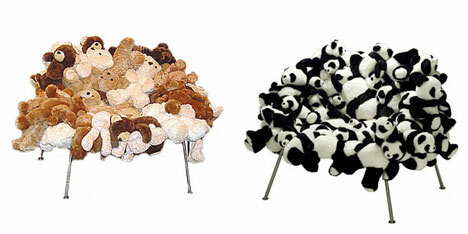 Designers Fernando and Humberto Campana took the idea one step further and made these chairs, which are essentially a bunch of stuffed animals all piled up and waiting for you to curl up on them. 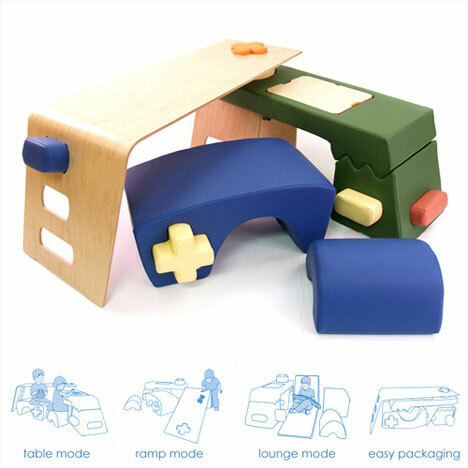 The designers at P’kolino don’t think that kids’ play should be limited just to toys. Their P’kolino play table lets kids reconfigure it into lots of different positions for hours of exploratory playtime. These chairs with storage under the seats may not be the most innovative or unusual design ever. But anyone who has kids knows that you need all the storage space you can get. If you can double up on seating and storage, all the better. Kids can keep art supplies, books, toys, and all kinds of treasures in under the wooden lids. 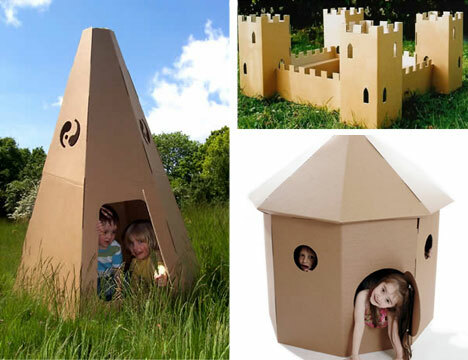 If you’ve ever bought your kid a big, expensive toy only to watch him ignore the toy and climb into the box and have hours of fun, these cardboard play sets are for you. They’re made from recycled cardboard and they’re recyclable when you’re done with them. They’re pretty cheap, too, so you can let Junior go wild with the markers and tempera paints to design his own magical play area.